Oversized double door entry leads the way to this custom built home on popular Marion Avenue in Braeside. The versatile floor plan offers 1ST level Maple Flooring throughout, high ceilings, crown molding & custom oversized solid Maple doors on all 3 finished levels. Large Maple & Granite Kitchen W/Island seating, Bay window & Stainless Steel appliances. 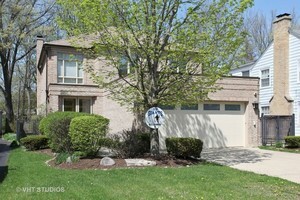 Spacious Family Room W/fireplace & newer custom wood built in shelving & cabinet storage. Separate Dining room W/floor to ceiling windows. Second level W/ 4 bedrooms total including a very large Master Suite W/private Bath offering double sink Granite vanity, Granite dressing table, separate tub W/jets & steam shower. Large custom fitted walk in closet completes the Suite. The open to first level basement is finished & completes the home with a 5th bedroom and an office. 1st floor laundry & a security system.